Are there any tax implications to giving a gift to my employees? In December, many employers choose to show their gratitude to employees with a gift. Before giving gifts, the employer should consider the tax implications. A cash gift, or a near-cash gift such as a gift certificate, is always considered a taxable benefit and is reported as income by the employee on their personal tax return through their T4 slip. However, non-cash gifts are treated differently. 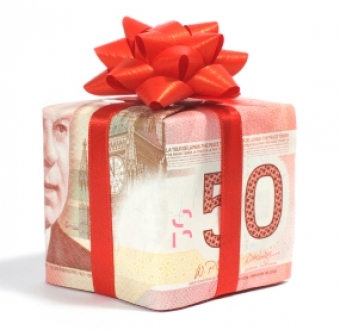 The Canada Revenue Agency has an administrative policy that exempts non-cash gifts under certain circumstances. Also, whether the employer is dealing with the employee at arm’s-length or not is an important factor. As long as the total value of all non-cash gifts during the year does not exceed $500 per employee, the gift(s) are non-taxable to an arm’s-length employee. The value of non-cash gift(s) that exceed $500 (per employee) is considered a taxable benefit by the Canada Revenue Agency and must be included on the employee’s T4 slip. In order for non-cash gifts to fall under this policy, the gift must be for a special occasion – such as a religious holiday, birthday, wedding, or the birth of a child. It’s important to keep in mind that all gifts that are given to non-arm’s-length employees are taxable, whether they are cash or non-cash gifts. Always consult with your tax professional before calculating taxable benefits related to gifts. I would just like to extend my thanks to an employee, Allison, for her care of my Mother and myself. I feel that she has worked very hard on our behalf and has exceeded service through The Accounting Place. Greatly appreciated Allison, keep up the good work and we look forward to coming back. Allison is Great – we are now customers for life.